Karen Kay Buckley's Perfect Circles - KAREN KAY BUCKLEY-Perfect Circles. Use these circle templates to create perfect circles for both hand and machine applique. 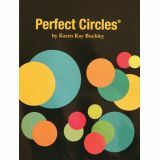 This package includes fifteen different size circles, ranging from 7/16 inch up to 2 inches: four circles in each size: 60 total circles and instructions. Imported.